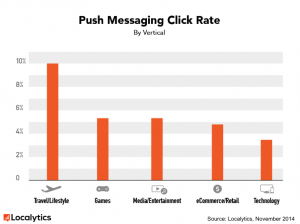 52% of people opt-in to receive push messages from their apps. 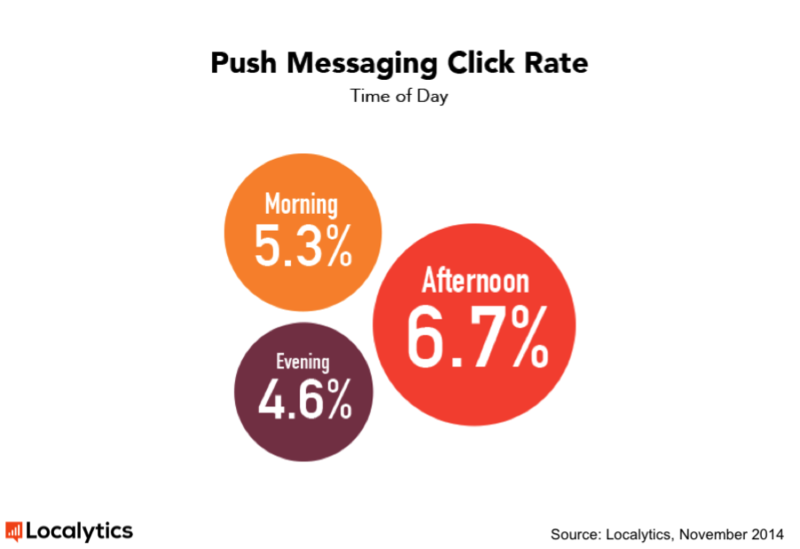 This means that over half of your user base is letting you message them, even when they are outside the app. 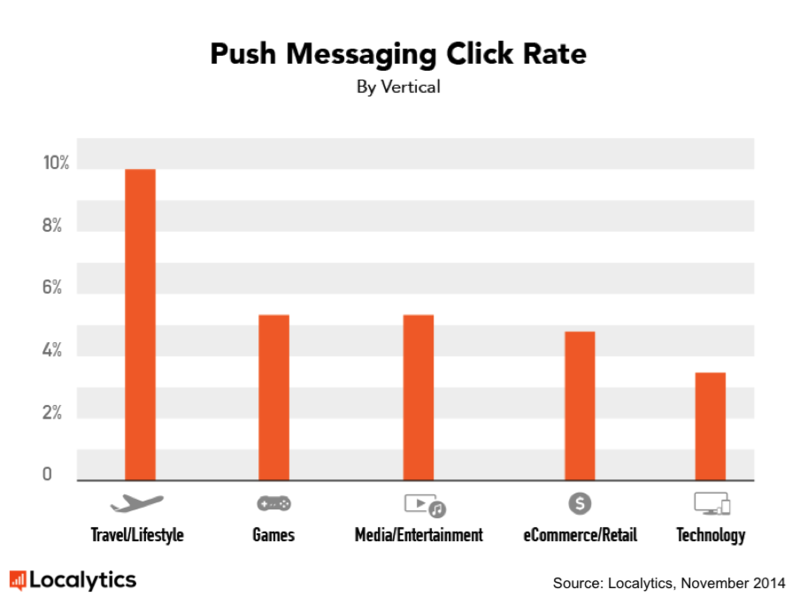 Sending out timely, personalized push messaging is an excellent way to re-engage users, or “push” them back into the app. 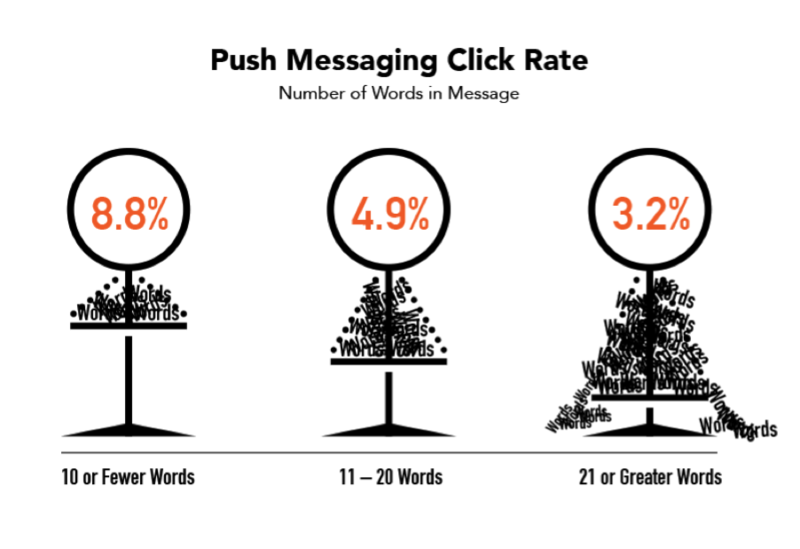 So why is there such a negative stigma around push messages as annoying, intrusive and ineffective? Because like all great marketing, they have to be useful, relevant and engaging to work. People are near their phones more during the workday, and often seek out distractions for quick work breaks. 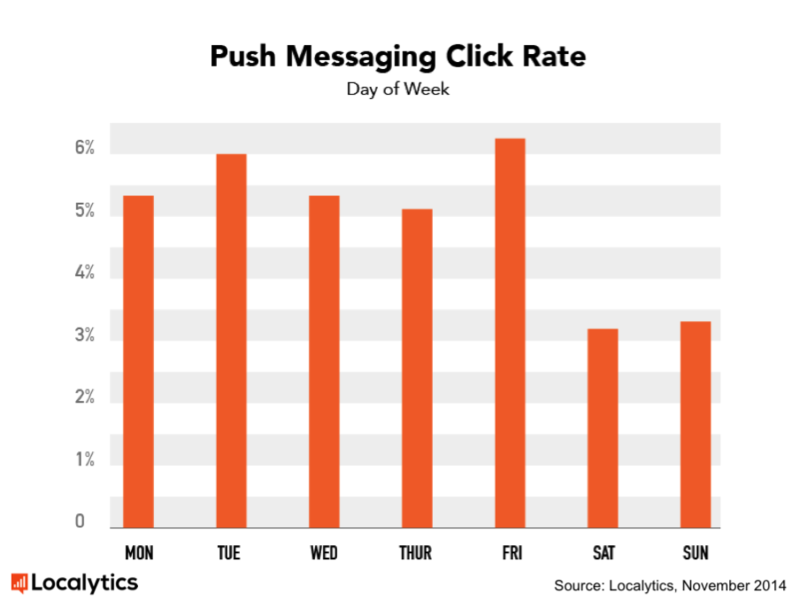 Target your campaigns to send on days with the highest click rate to capitalize on this behavior and appeal to users when they’re looking for a 5-minute break. 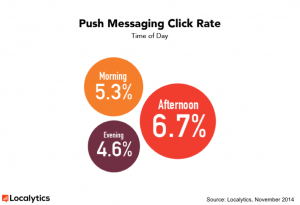 Push messages have the greatest click rate in the afternoon (from 12PM to 5PM). 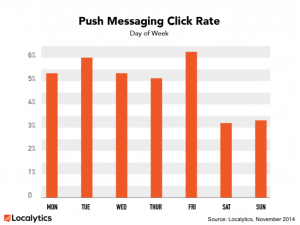 Use this data to refine your campaigns further, and send them in the afternoon. Users are sensitive to ill-timed notifications, as they can be disruptive when sent at the wrong moment. 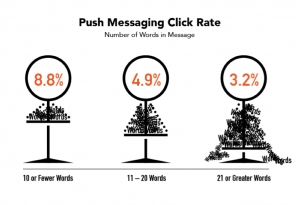 Shorter messages have a higher click rate, by a large margin. Remember, depending on the actual smartphone your push is received on the amount of words that appear on the lock screen varies. Certain smartphones have smaller screens, which results in fewer words appearing on the lock screen. Because of this, shorter messages are generally more effective since the entire message will appear on the screen. So keep your messages clear, concise, and compact. You want to quickly make clear the purpose of the push message. With few seconds to catch a user’s attention, your message needs to identify the value, goal or reward behind the notification to prompt an open. Tip 4: Tell Them; Don’t Ask! 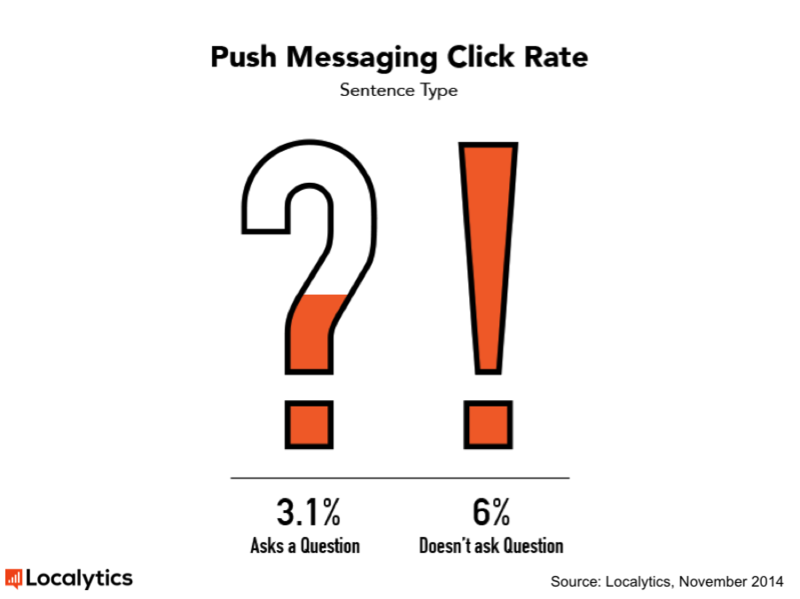 Asking a question and then answering it may seem smart in practice, but remember that you are working with limited real estate on the lock screen, and most users are looking for more definitive content. Be more straightforward with your language, and avoid wasting space with questions. 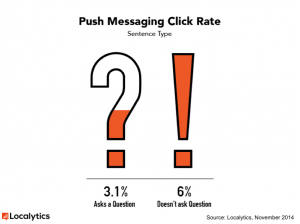 Certain industries have higher click rates than others, depending on the content and timeliness of the message. Travel and lifestyle apps, which often offer quick information, are more likely to be interacted with than messages with a more complex call to action. Take a page from the Travel & Lifestyles app marketing playbook. Often, they offer information relevant to a specific trip, booking, or service, and are used to inform the user of important updates or changes. This kind of relevancy can be applicable to your push messaging, too. 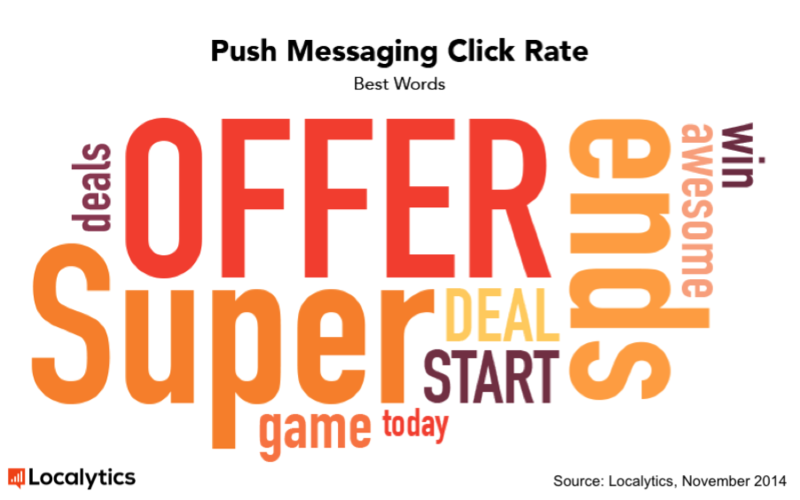 Words like “offer,” “super,” “ends” and “deal” surprisingly have a higher click rate than game-specific language. “Win” and “today,” in particular, saw poorer performance, signaling that while sales-based terminology garners more clicks, sweepstakes or one-day only deals might be less popular. Words that indicate a special deal the user can access should be used as a part of your strategy (as long as it’s appropriate).